The Cheat Lake Trail is the result of a generous donation of land by Allegheny Energy (now FirstEnergy) near its Lake Lynn Power Station on scenic Cheat Lake. The area was once home to West Penn Beach, a cluster of vacation cottages available for rent by company employees in the 1920s. While the rental properties are no more, the original appeal of dense woodlands and scenic lake views remains. The Cheat Lake Trail courses through this landscape on a former rail corridor, offering ample opportunities to view local flora and fauna. Perhaps the best spot is at the trail’s southern end near Greystone, where a nature viewing area is dedicated for this purpose. Farther north, a fishing platform, boat dock, playground and picnic tables can be found in the Cheat Lake Trail’s adjacent park. 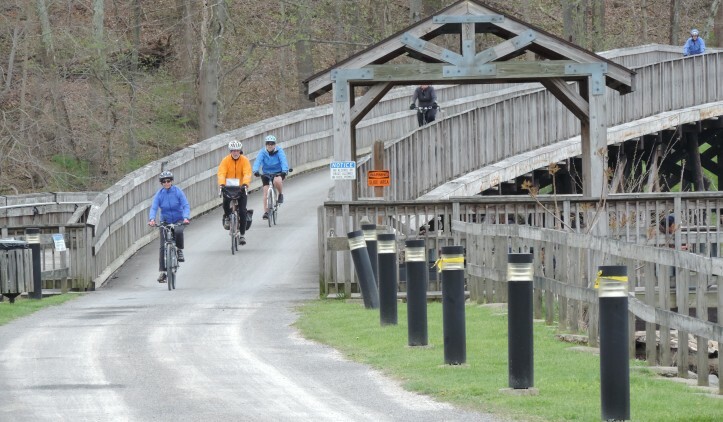 The Cheat Lake Trail can be accessed via the Cheat Lake exit on Interstate 68. Follow the signs for State Route 857 and turn left onto the highway. Then turn left onto Morgans Run Road. Be careful, as the road is narrow. Morgans Run Road ends at the trail’s main parking area.